Happy Friday everyone! 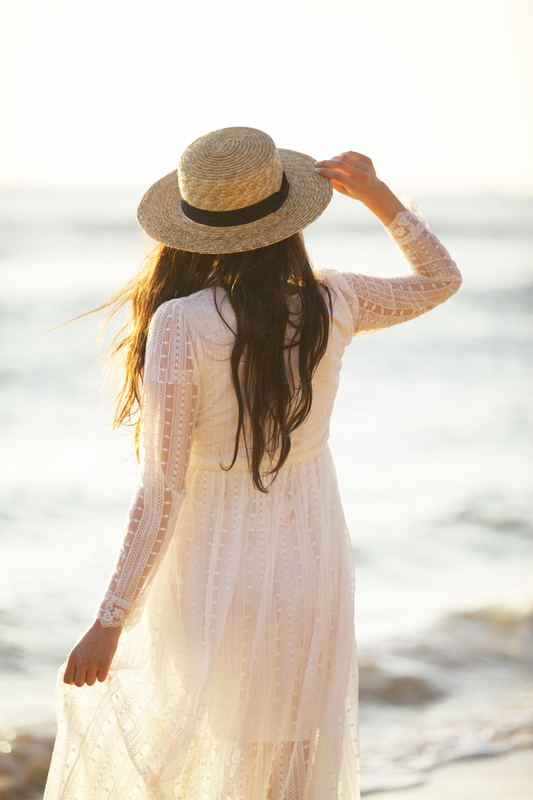 There’s something about a beach and white lace dress that makes for the perfect combination! Every time I’m getting ready to head on a tropical vacation, I find myself searching for the perfect lace dress to add to my cover-up collection. I love this style from ChicWish because it totally works as a cover-up but also just a great spring/summer dress to wear to during the day or night. What’s your favorite type of dress to take with you on vacation? Your lace dress looks marvelous! Beautiful pics! That dress is stunning on you, Rachel! Such gorgeous pictures!! I honestly think those are the most beautiful photos Ive ever seen on the blog. So natural and stunning. Definitely to be framed and cherished. Looking so beautiful in this romantic outfit! Fantastic photos! I absolutely adore these photos. You look so bright and happy and you really are glowing from within. What a gorgeous coverup! I have been loving all your beach pictures! I love this piece from Chicwish! I actually have a couple of pieces from them but the only downside is the shipping time, otherwise they are my go-to for trendy styles! Wow! You make this dress look beautiful. Amazing pictures. Wow such beautiful photos! This dress is perfection on you! Love the dress, you look lovely against the sunset. That dress is amazing! Love that it works for a brunch date or day at the beach. You are absolutely right. I think the same thing! Lace/crochet and white. Doesn’t matter what beach, it just has to be a lace or crochet and it has to be white! What a gorgeous look! That dress is darling! SO jealous of that warm sunshine! White lace at the beach is just about as close as perfection as possible! I love this dress, and the hat is adorable on you- such a fun twist on a panama hat! You look absolutely stunning in this white dress! I completely agree that this dress is so versatile. Definitely a good buy. Rachel, you look absolutely stunning! Can’t wait till baby peony gets here! LOVE the dress!! Looks adorable with your baby bump! Lovely dress, you look stunning in it! It depends on where I go but I like to take a pink dress because it’s my favorite color and a white, because it goes with everything! So pretty! Love that dress. I love the 70s vibe of this dress and I’m so excited that this trend looks like it’s going to stick around for awhile! You look gorgeous Rachel! That dress is amaze. Enjoy the rest of your vaca in paradise! These photos are frameworthy. Love!! Super cute I love the flowy lace coverup for the beach! Looks like it’s gorgeous there! This is an absolutely gorgeous ethereal look! You look stunning!! Such a pretty white, lace dress! Love this look! You look like an angel in this outfit. I think this is one of my favorite photoshoots of you ever! I love the feminine, flowy white dress and the beautiful soft lighting – and of course your pregnant belly. Love! This coverup is gorgeous! I love the detail! Your bump is the cutest!!! So cute! The dress on the model on Chic Wish’s site looks sooo different, I love the way you styled it and made it more versatile! Your pictures make me want to book a vacation immediately:) You look amazing in your pictures! I love the white dress with the beach and sand. This is soo cute! Loving these photos, looks like an awesome vacation!! I really love this lace dress on you. You are such a cute pregger! What a gorgeous sunset! I agree, white lace dresses are the best! Did you place the same photo 3 times, or is it just me? Idk but that black and blue dress has my eyes all messed up lol. Hi Rachel! – First and foremost.. you look STUNNING!! Second, I was hoping you’d be able to share what size dress you have, as Im about the same size as you right now, and not sure what size to get!! Stunning dress, you look so happy! One of the most beautiful pregnant women I have ever seen! I like your dress, so pretty. Lovely pictures!! The white dress looks incredible on you! Romantic, feminine, and flowy. I love your dress, way too perfect for beach getaway! You look so lovely in this pretty lace dress and like how much you are glowing! Beautiful beach images too! Really beautiful, this post gives me hope for some semblance of a cute wardrobe for baby #2. Gosh what lovely maternity shots. You should print these out for your baby book. Beautiful! WOW! You Look soooo beautiful. I Love the weite dress and the Combination with the hat is Perfect. How gorgeous is this dress?! You look absolutely beautiful! GORGEOUS PICTURES!! LOVE THAT DRESS!! i almost ordered this as a coverup! you’re wearing it amazingly and it has me sold! You should smile more! Reminds me of my excitement awaiting my baby girl just a few months ago as well.